« Did the Wave Election Put Tax Reform on the Agenda? I’ve been fretting for a long time that poorly designed entitlement programs are going to turn America into a decrepit welfare state. Medicare obviously is a big part of the problem, but the fraud-riddled Medicaid program may be even worse. The program is a nightmare for both federal taxpayers and state taxpayers. In an article for the Daily Caller, John Graham of the Independent Institute has some very grim analysis of the fiscal black hole otherwise known as Medicaid. 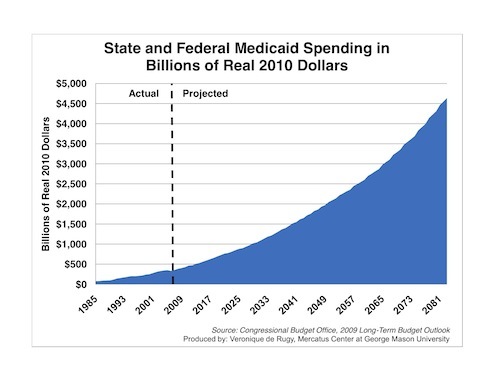 In 2014, total Medicaid spending is projected to grow 12.8 percent because Obamacare has added about 8 million dependents. A large minority of states have chosen to increase residents’ eligibility for Medicaid by expanding coverage to adults making up to 138 percent of the federal poverty level. Unfortunately, more states are likely to expand this welfare program. This is expected to result in a massive increase in the number of Medicaid dependents: From 73 million in 2013 to 93 million in 2024. Medicaid spending is expected to grow by 6.7 percent in 2015, and 8.6 percent in 2016. For 2016 to 2023, spending growth is projected to be 6.8 percent per year on average. This comprises a massive increase in welfare dependency and burden on taxpayers. But the actual numbers may be worse than these projections. …official estimates often low-ball actual experience. This is because it is hard to grapple with how clever states are at leveraging federal dollars. …The incentive lies in Medicaid’s perverse financing merry-go-round. In a rich state like California, for example, the federal government (pre-Obamacare) spent 50 cents on the dollar for adult dependents. So, if California spent 50 cents, it automatically drew 50 cents from the U.S. Treasury. And most states had a bigger multiplier. Which state politician can resist a deal like that? …The situation will deteriorate because Obamacare’s Medicaid expansion significantly increases states’ perverse incentives to game Medicaid financing. …Newly eligible Medicaid beneficiaries will be fully financed by the federal government for 2014 through 2016. Then, it slides down until the federal government funds 90 percent of their costs starting in 2020, with the states footing 10 percent. Recall the cunning with which states developed ways to abuse federal taxpayers when they could only double their money from Uncle Sam. The new normal is that they will be able to get nine times their money! By the way, these numbers would be even worse if it wasn’t for the fact that many states refused the lure of “free” federal money to expand Medicaid. So what’s the solution? Graham suggests federalism is the answer. A reform in the right direction would be to get rid of the federal match in favor of a block grant, based on a simple measurement of the population in each state, and precisely define a limited federal commitment. He’s exactly right, at least in the short run. Let’s copy the success of welfare reform and turn over a fixed amount of money – along with concomitant authority and responsibility – to state governments and let them figure out the best way of delivering health care to lower-income populations. In the long run, of course, I’d like to phase out the block grant so that states are responsible for both collecting the money and providing the services. But before we get to the point of adopting health care policies for an ideal libertarian society, we first have to stop the bleeding (or, to be more accurate, hemorrhaging) and stabilize the program. And that’s why I fully agree that the federalism approach, in the form of block grants, is the right policy. Here’s my video on the topic. And since I’m sharing videos, I can’t resist commenting on the latest “Gruber-gate” scandal. 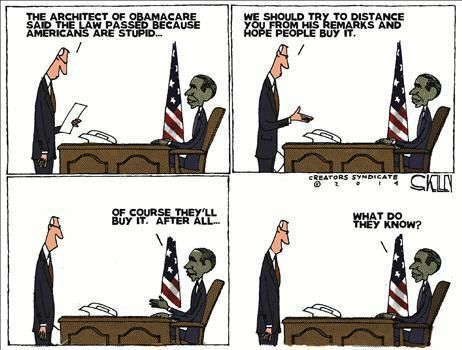 The MIT professor and Obamacare insider (he got $400,000 of taxpayer money to help design the plan) has become an embarrassment for the left because he has been caught on tape saying that the legislation relied on deception. He even said that proponents of Obamacare took advantage of the “stupidity” of American voters. You can watch the most well-know example by clicking here. But he also denigrated supposedly “stupid” Americans in this video. I want to defend one small component of Gruber’s statement. But I want to be completely clear that I’m not defending his elitist disdain for ordinary Americans. Indeed, I don’t think voters are stupid. Instead, to the extent they’re uninformed, it’s the result of serial dishonesty from Washington or because they’ve decided it’s not worth their time to pay attention to the crowd in DC (the “rational ignorance” hypothesis). The part of Gruber’s statement that has merit is that he’s talking about the fact that there’s a big loophole in the tax code for fringe benefits. To be more specific, tens of millions of Americans get part of their compensation in the form of fringe benefits such as health insurance. Yet while workers are taxed on their “cash” income, they are not taxed on their “fringe benefit” income (a policy sometimes called the “healthcare exclusion”). And this has created, over time, a very inefficient system of over-insurance. To understand why this system doesn’t make sense, just think about your homeowner’s insurance or auto insurance. Those policies, unlike health insurance, work reasonably well and costs remain relatively stable. Why is there a big difference? The difference is that employee income that is diverted to health insurance avoids both income tax and payroll tax, so there is a significant monetary incentive for gold-plated plans. And these plans often include insurance coverage for ordinary medical expenses, which contributes to the problem of third-party payer. No wonder health insurance is so costly. After all, imagine what would happen to the price of your homeowner’s insurance if it had to cover the cost of a new couch? Or repainting the hallway? Or what about the cost of your auto policy if it covered the cost to fill up with gas or get an oil change? We instinctively recognize that this would be insanely inefficient and expensive, yet that’s how our health insurance system operates thanks to a giant tax preference. So Gruber was right to say it’s a problem. And I’ve even said that addressing the exclusion is a very tiny silver lining in the awful dark cloud of Obamacare. But now that I’ve bent over backwards to say something nice, now let me point out that Gruber (and Obama and other statists) didn’t have the right solution. Yes, they wanted to cut back on the tax exclusion, but only because they wanted to use the money for other purposes (such as subsidies that also exacerbate the third-party payer problem). The right approach, by contrast, is to phase out the healthcare exclusion and use every penny of revenue to “pay for” lower tax rates. That way you get a win-win situation for the economy. A more rational, market-based healthcare system and a less punitive tax code for productive behavior. Now that we’ve addressed a serious point, let’s laugh about the fact that Gruber’s comments have created a big headache for the White House. We’ll start with this Steve Kelley cartoon. 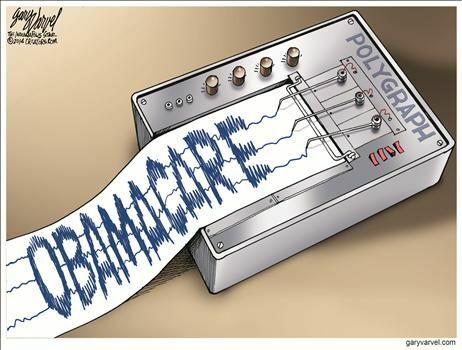 And here’s Gary Varvel’s take on the honesty of the Obama White House on the topic of health care. 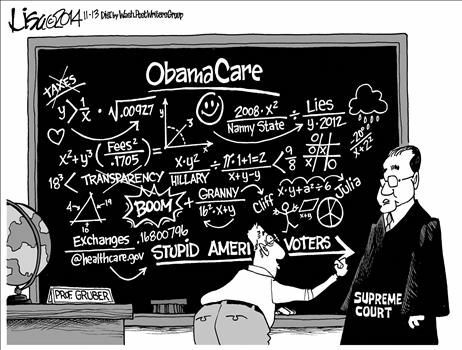 Last but not least, Lisa Benson optimistically suggests that the serial dishonesty of Obamacare supporters may be undone by the Supreme Court. Which would be poetic justice, since Professor Gruber also was caught on tape – over and over again – stating that Obamacare only allowed subsidies for people getting insurance policies through state-based exchanges. And now the Supreme Court will decide whether those subsidies, notwithstanding statutory language, can be provided via the federal exchange. Though I’m not holding my breath since certain Justices on the Court already have demonstrated that they’re willing to put politics above the law. P.S. Just in case I wasn’t sufficiently clear, good tax reform also is good health reform. That was one of the points I made in my tax reform speech at the Heritage Foundation and I suspect I’ll continue making that argument until we win or I’m dead (and I don’t want to take odds on which happens first). P.P.S. On a more upbeat note, the House of Representatives approved budgets in 2011, 2012, 2013, and 2014 that assume Medicaid gets block-granted to the states. So that reform may actually happen while I’m still breathing. – What political power was able to keep these statements by Gruber repressed from release to the public for so long? – How many more seats would the democrats have given up had this been released prior to the election? Yes, Dan, you are correct- there will always be corruption in third-party payer systems because the recipient really does not care what the payer paid to the provider so long as it doesn’t come from his pocket. To return to your automotive case- we also found similar rampant fraud in automotive warranty systems. I mean- who cares what the dealership charged to fix your warranty problem, since it was charged to the auto company, right? Can someone give me an example of a country, or an electorate, that reversed the trend towards more and more government healthcare? Perhaps only the ex soviet republics…. after they hit bottom and collapsed! As far as voters, my best leading indicator is that Silicon Valley voters reelected all the ObamaCare promoters, the Democrats, by a 75% to 25% margin. In other words, the most “intelligent” and sophisticated voters in America want to Europeanize. So is there much doubt as to where this country is headed? Even if there is a sliver of doubt left, which scenario is more likely, so that those more rational of us — and especially our children — can make plans on? Take a close look at who survived in Europe, which individuals are faring best amongst the European decline, …and mimic them. While that will actually hasten America’s decline, the alternative is to remain a patriotic fool and get screwed on a personal basis. To say it in different words: If the American electorate wants to commit suicide,… get in the poison business, so that at least you and your family fares less bad than the sea of voter-lemmings who seem to be oblivious as to where they are driving the country. Let THEM be the ones who hope. Having immigrated from Europe I have seen this movie. And from talking to American voters I have virtually zero reasons to hope that the trajectory will be any different in America. Americans are further behind but the trajectory is the same. Hindsight will be 20/20. You have to stay mobile and keep your options wide open. The lure of coercive collectivism is so strong that few, very-very few, electorates will make the right choices. These electorates are so rare that are virtually impossible to spot at this point ( but if anyone has any insights, I’m very interested). That is why one must keep his options open by being mobile. I understand this is not quite that easy for those of you who have extended families and roots in the USA. Once the decline takes root the most competent and mobile will quickly flee, leaving the “patriots” to support an ever growing proportion of mediocre welfare voters. Past the tipping point, a negative spiral form and things will unfold quickly.